It All Began With Mother Goose . . . I'M A CRACKED POT! WHAT ARE YOU? Are you a cracked pot, too? From the West Side to the East Shore. What fun to be a cracked pot! At perfection and all that! CATHERINE PASCUAL LO'S love for poetry began with Mother Goose! And her fourth-grade teacher at Laoag Central School, Philippines, Miss Brigida Cruces, who also served as school librarian, opened the world of books and poetry to her. Miss Cruces also taught her students penmanship, and Catherine started scribbling poetry to practice callligraphy. None of those first attempts remain. However, some of her early poems and prose were published in the newspapers of Ilocos Norte High School, Philippines, and Kauai High School, Hawaii. She has continued writing for the joy of it, and her poems, essays, and articles have appeared in a variety of publications. BORN IN LAOAG, ILOCOS NORTE, Philippines, Catherine Lo came to Hawaii with her family when she was 16 years old and graduated from Kauai High School. She attended Thiel College, a Lutheran-Church-affiliated liberal arts college on full scholarship, but after three years of cold and snow in Greenville, Pennsylvania, she returned to balmy Hawaii and finished her senior year at the University of Hawaii at Manoa, where she received a Bachelor of Arts in English. EMPOWERED BY SCHOLARSHIPS from the Friends of the Library of Hawaii and Hawaii Community Foundation, Catherine earned a Master of Librarianship from the University of Washington, Seattle. AFTER COMPLETING GRADUATE WORK, Catherine returned to Hawaii to meet the service requirements of her scholarship grants, and she worked at the Library of Hawaii in Honolulu as a catalog librarian for one year before assuming the position as bookmobile librarian at the Kauai Public Library. She was subsequently promoted to catalog librarian, a position she filled with passion, but marriage to Karl Lo, whose career was with the United States Coast Guard, ended her work on the island she loved, and she dutifully moved with her husband to Sault Ste. Marie, Michigan. During their two-year-stay in Michigan's cold upper peninsula, Catherine served as assistant director of the Eastern Upper Peninsula Library System (EUPLS) and set up book stations in areas that did not have library service. She also served as children's librarian at Sault Ste. Marie Public Library, where the EUPLS was headquartered. One aspect of her work at "The Soo" that she enjoyed beyond words was writing a weekly column -- "Notes on Books" -- for THE EVENING NEWS, Sault Ste. Marie's daily paper. AFTER LIVING IN MICHIGAN for two years, Italy for two years, and New York for four-and-a-half years, and with Karl retired from the Coast Guard, the Los returned to the island they love and settled in Po`ipu in the South Shore of Kaua`i, where Karl grew up. THE YEAR WAS 1973, and the State of Hawaii was in sad financial state. State jobs were frozen following retirements and deaths. Catherine wanted to return to the Kauai Public Library, but the reference librarian position she could have filled was frozen in April. FORTUNATELY, Serendipity once again took Catherine by the hand and led her to the Kauai District Office of the Department of Eduction that late Thursday afternoon in early September to file her application for substitute teaching. To her surprise, the principal of Waimea School (now Waimea Canyon School) called her at 9 o'clock the following morning, and offered her the position of librarian for the 1973-1974 school year. Her job description included planning and coordinating the move of the library collection from temporary headquarters to a new facility. CATHERINE LO JOINED the staff of Kauai Community College (KCC) Learning Resource Center in October 1974 to organize the non-print collection of the college, which consisted of 629 audiotapes, 286 filmstrips, 199 phonodiscs, 1,436 slides, and 13 videotapes. Libraries were expanding their book collections by adding non-print/media materials, which at KCC, like in most libraries, were largely uncataloged and hard for faculty and students to locate. As media cataloger, Catherine was doing that aspect of librarianship that librarians love to hate but which she loved with a passion -- the cataloging and organization of materials to make them accessible. IN SEPTEMBER 1975, Catherine was hired to fill the newly-created position of assistant librarian for technical services. As an assistant professor on tenure track, Catherine started yet another chapter in her always engaging and challenging career. With the head librarian on sabbatical leave, Catherine stepped in to coordinate the move of the college library to the new campus in Puhi in December 1976. Hurricane 'Iwa destroyed the college library in November 1982, and during the renovation the latter part of 1983, with the head librarian on another sabbatical leave, Catherine in her capacity as acting head librarian, once again served to implement plans to put the books, periodicals, media resources, and equipment where they belong after the ceilings and carpeting on two floors in the 36,000 square-foot facility were replaced. WHEN CATHERINE LO TOOK OVER as head librarian in January 1987, her focus was the automation of Kauai Community College Library. Linking the library with the other libraries in the 10-campus University of Hawaii System on the integrated online library system was an exhilarating challenge that Catherine welcomed and handled with confidence once she got over her initial trepidation with computers and technology. 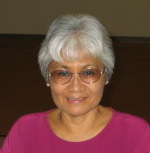 CATHERINE LO RETIRED as full professor in December 1992 after serving Kauai Community College for 18-1/2 years. She continued working on "The Garden Island Index," which kept her busy for another decade, but she found more time to write poetry and to revisit her file of 300 some poems, many of which she wrote while she and Karl lived in Italy and New York. TO CATHERINE PASCUAL LO, life is like a coin. For her, the obverse is librarianship; the reverse, poetry. As a working librarian, especially when she was a cataloger, she read by day and wrote by night. In retirement, she writes by day and read by night. THE ENGLISH LANGUAGE, which was Catherine's second language, is a puzzle and a challenge, and for her, writing poetry is an enjoyable way through the English language maze where she often finds herself. When she loses direction, which happens often, she calls upon experts to help her by reading the books that surround her. "THE GARDEN ISLAND INDEX" continued to keep Catherine busy in librarianship another decade after she "retired." THE CULTURAL, SOCIAL, EDUCATIONAL economic, religious, political, literary, artistic, and athletic history of Kaua`i is chronicled on the pages of "The Garden Island" newspaper. And the newspaper is a primary source of biographical information sought by genealogists and other researchers. But without an index to the newspaper, locating wanted information is difficult. LIBRARIES ON KAUA`I have long recognized the need for an index to "The Garden Island" as the only solution to the difficulty in finding information from the pages of the newspaper. But no library on the island has the staff or financial resources to undertake the monumental task of indexing decades of the newspaper. AWARE OF THIS NEED, members of the Kauai Library Association (KLA), an association of school, public, college, and special librarians, voted in March 1977 to take on the indexing of "The Garden Island" as an association project. As such, the indexing started as a wholly volunteer effort and remained for the most part a volunteer effort for 24 years. THE INDEXING WAS STARTED before libraries in Hawaii were automated, when 3x5 cards and card catalogs were tools that made libraries function efficiently and effectively. The indexers, therefore, used 3x5 cards to lift historical and biographical information from the pages of the local newspaper, creating a card index. They made a big push on the project between 1977 and 1987, indexing current as well as retrospective issues of the newspaper. JOINING WHAT WAS AN ASSOCIATION of practicing librarians were library technicians, library assistants, retired librarians, and other library-oriented members of the community eager to work on the project. The concerted effort of the indexers during the1982-83 academic year brought to completion the indexing of the 1971-1980 issues of the newspaper. In addition, the indexers worked on other decades of the newspaper. CATHERINE LO SERVED AS EDITOR and director of "The Garden Island Index," and dedicated 25 years of volunteer service to the project. The card index is located at Kauai Community College Library. The 1911-1929 section of the index is accessible on the KCC web site: www.kauaicc.hawaii.edu/. Or, user can access the index on Google.com by simply searching under "Garden Island Index." IN MAY 1987, after 10 years of work by more than 40 volunteers, the Kauai Library Association published "The Garden Island Index, 1971-1980," a 328-page folio size volume, with funding from Alexander & Baldwin, Friends of the Library of Hawaii, H. S. Kawakami, McInerny Foundation, Elsie H. Wilcox Foundation, and the G. N. Wilcox Trust, who responded to Catherine Lo's proposals for grants, the writing of which was part of her sabbatical project during the 1982-1983 academic year. A RESOUNDING RECOGNITION of the project came in September 1987, when Hawaii's First Lady Lynne Waihee named "The Garden Island Index" as Kaua`i's most innovative project and recognized its volunteers: Karl Lo as outstanding adult individual, Harriet Albao as outstanding senior volunteer, and the Kauai Library Association as outstanding volunteer organization. Accepting the award for KLA was Diana Oyakawa, president of the association for two consecutive terms, 1985-1986 and 1986-1987, who also chaired the Index Finance Committee. Accepting the award for the project was Catherine Lo, editor/ project director. THIS WAS THE FIRST TIME in the 11-year-history of the First Lady's Outstanding Volunteer Awards that a single project and its volunteers swept four of the five categories, the fifth category being youth volunteer. "A poet's autobiography is his poetry. Anything else is just a footnote." For the May 30 to July 25, 2002, exhibit at Kauai Museum, Helen Mehl interpreted on canvas 11 of Catherine Lo's poems, which were framed and displayed alongside the paintings, of which there were 13. The chosen poems -- AND FALLING TOGETHER, a haiku on Maha`ulepu, THE BACKYARD BOASTS OF A MANGO TREE, GOLD TREES ON PO`IPU ROAD, I'M A CRACKED POT! WHAT ARE YOU?, LEARNING TO BE CONTENT, LET LOVE BE FRUGAL, LITTLE PONDS AT PAGODA GARDEN, MAHA`ULEPU, MRS. ALTER, SEA AT MY WINDOW, and THERE ARE NO POINSETTIAS IN THE PHILIPPINES are included in a 52-page volume of poems, "Learning To Be Content," which was compiled for the exhibit. THE CHAPBOOK was available for purchase at Kauai Museum Gift Shop in Lihue, Borders at Lihue, McBryde & Allerton Gift Shop in Po`ipu, Tin Can Mailman Books & Curiosities in Wailua, and Talk Story Bookshop in Hanapepe. The Garden Island Index: A subject, author, and photographer index to selected article in The Garden Island, 1971-1980. Catherine Lo, Editor/Project Director. Karl Lo, General Assistant. Associate Editors: Martha Doutt, Robert Kajiwara, Joan Kunimura, Katherine Peters, Bonnie Shimatsu, Sandra Trenholme. Assistant Editors: Isabel Adorable, Harriet Albao, Edith Hashizume. Published by Kauai Library Association. Lihue, Kauai, Hawaii, 1987. Printed by the University of Hawaii Press. 312 p. Oversize. 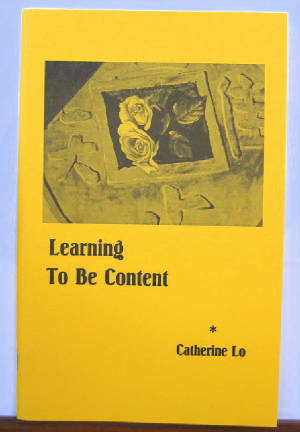 Learning To Be Content: Selected Poems of Catherine Lo. Koloa, Kauai, Hawaii: K & C Co., 2002. 52 p.
Lihue Lutheran Church: A Centennial Album. Research, text, and layout: Catherine Pascual Lo; photography: Karl Lo, James Haas, Keyte Haas, Manuel Rasay. Lihue, HI: Lihue Lutheran Church, June 1981. 96 p. ( Listed in the bibliography of Edward Joesting's KAUAI: THE SEPARATE KINGDOM. 1984). Some Help In Ilocano For Helping Profesionals: A guide containing words, phrases, and sentences useful to physicians, nurses, social workers, teachers, and other "helping professionals," by Catherine Pascual-Lo, Teresita Sotelo, Isabel Adorable. Lihue, Hawaii: Kauai Community College Learning Resource Center, 1986. 78 p. illus. Reprinted 2002. Prepared for the Tobacco Prevention and Education Program, Kauai District Health Office, Department of Health, State of Hawaii. Lihue, Kauai, Hawaii: September 2002. "The Day Freedom Came" -- Coins, January 1976. p.90. (Article on the Roosevelt-Quezon peso). "Eleele On Kauai" -- Mitchell's Hawaiian Philatelist, Vol. IV, No. 5, September 1982. p.56-57. "The Garden Island Index: A Key to Kauai's History" -- The Hawaii Library Association Journal, Vol. 40, 1983. p.17-31. "Koloa Walking Tour" -- Compiled by Catherine Lo. Based in part on the Koloa History Project by the Friends of Koloa Community /School Library. 1989. Revised 1992. Map by Manuel T. Rasay. (2-fold). Inserts, December 2004: Koloa Walking Tour: An Upate; Koloa: Recent Sources; Koloa: Selected Sources, Compiled by Catherine and Karl Lo for the Koloa Walking Tour. Notes On Books. Weekly column on children's books and on children and reading in The Evening News, Sault Ste. Marie, Michigan. April to June 1966. Guide by the Friends of the Koloa Community/School Library; edited by Martha Hoverson. Koloa, Kauai, Hawaii, 1985. 32p. Researched and wrote "Tree Tunnel" (p. 17), and "Lawai-Kai" (p.25-26). Assisted with "Eddie Spirer, 'The Little Minister' *Bagel Gospel, Jelly Roll Ministry+ by Ross F. Hidy. Concord, CA, Lutheran History Center of the West, 1992. 82p. (Provided historical accounts and photographs. Coined "Bagel Gospel and Jelly Roll Ministry" in 1984, and the phrase is immortalized in Pastor Hidy's book and on Pastor Spirer's tombstone at Lihue Lutheran Church Cemetery). The Filipinos of Koloa. Part One: The Filipinos and the Koloa Experience, 1910 - 1996. Part Two: Remembering New Mill Camp. Koloa, Kaua`i, Hawai`i: K & C Co., 2017. 220 pages. Oversized. Remembering New Mill Camp. Photography by Karl H. Y. Lo. Koloa, Kaua`i Hawai`i: K & C Co., 2014. 78 pages. Oversize Booklet. Koloa Union Church. 12-page pamphlet. Text and format by Catherine Lo. 2008. Koloa Union Church. Two-fold brochure. Text and format by Catherine Lo. 2008. Iliahi: Home of Caleb & Florence Burns, 1934 to 1967. Two-fold brochure. 2007, 2012. GARDEN ISLAND INDEX, 1911-1929 is on the web site of Kaua`i Community College. Open LEARNING & COMPUTER RESOURCES ... LIBRARY .... FIND MAGAZINE, JOURNAL, & NEWSPAPER ARTICLES. GARDEN ISLAND INDEX (1911-1929) is under NEWSPAPER. The short route to the index is to search GARDEN ISLAND INDEX in Google.com. "Lisa-Marie, "When there's a will, there's a way." Representing the family, she's the "Pascual Senator." Picking opihi and limu for Grandma to make a special dish. Strings of pearls and jade...gifts from her Mother-in-Law. perhaps one day your Mother-in-Law will grace you with gifts like this too." And I found that I was given so many more riches in that relationship than gifts of jade and pearl. I'm glad that I was good to my Mother-In-Law. But I definitely don't purchase what I don't need. I remember asking her how she was able to save her money. Oh, HOW THAT has gotten me through lean years. She was the first in our family to venture out and see the world. How she inspired the rest of us to take advantage of every opportunity to experience it. Appreciating the one we live in. Waiting to pick up Grandma from Woolworths. "Fat, cat, sat, mat, bat, rat..."
"OK, what rhymes with "RING"? but no one else will know what you are saying..."
She taught me that the best gifts in life are those homemade ones. Organizing meetings, getting the job done. She says "elephants are a symbol of memory and strength,"
And wonderful memories are a wealth of love, joy and happiness. Thank you for this amazing gift. Thank you for touching my life in so many ways.